Once, a beautiful town with palaces, markets, people and armies is now a ruined site. The Bhangarh Fort was built in the year 1573 as the residence of Madho Singh. He was the son of Raja Bhagwant Das and the younger brother of Man Singh I. After the decline of the Mughal Empire and the famine of 1783, the population of this place declined almost completely. This place is also known to be one of the most haunted places in the world and is called “The House of Ghosts” by the locals here. There are two bhangarh fort myths - first is that it was cursed by Guru Balu Nath, who said that if the shadow of any building reached his abode, the whole city will be finished. It is believed that once a king built his palace higher than the saint’s dwelling and after a few days the whole palace collapsed. The second bhangarh fort story is that a wizard called Singhia who was bewitched by the beauty of Princess Ratnavati tried to possess her by replacing her oil with a magic potion. But the princess got to know about this and she dropped the oil on a boulder which crushed the wizard. Singhia cursed that Bhangarh will be finished and the following year there was a battle which killed everyone who lived there including Ratnavati. It is still said that the fort waits for its princess to return. There are may more bhangarh fort incidents to make this place famous. So visiting Bhangarh Fort at night is only meant for the daredevils. A tall entry gate followed by lush green gardens. Beyond the gardens you will find beautiful little water bodies commonly known as ‘Bowli’. It is said that here people have noticed strange sounds of anklets tinkling. Further down, there is a ruin called the Dancer’s Haveli. Beyond this is the Purohit’s Haveli which has various temples in it. The main temples here are: Hanuman Temple, Gopinath Temple, Someshwar Temple, Keshav Rai Temple, Mangla Devi Temple, Ganesh Temple and Naveen Temple. Another aspect of this place which is very attracting is that the fort has 5 different entries known as- Lahori Gate, Hanuman Gate, Ajmeri Gate, Phulbari Gate and the Delhi Gate. Thus, this place is a wonderful view of the countryside in the Aravalli range. It is spine chilling with mysteries and Bhangarh Fort haunted stories unfolding at each step and then it is up to you to decide after the visit if this place is actually haunted or are these mere stories of the locals here! Entry to the Bhangarh fort is legally prohibited before sunrise and after sunset. Violation of this rule will lead to strict punishments. Be careful that if you are locked inside the gate after sunrise, there is no way of coming out as it extends to the area of the fort. The road here is muddy. The Sariska route is bumpy and you will have to ensure that you are following all road signs here. Do not follow this route in odd hours. Do follow the guide’s instruction word to word. It is preferred that you follow the NH 8 till Shahpura and then follow NH 11 till Bhangarh. 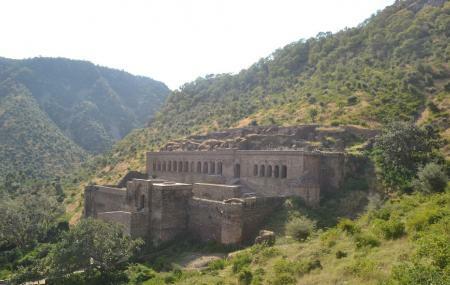 Bhangarh fort timings: all days of the week 6:00 AM to 6:00 PM. Nearest village is Dhausa if you are coming by train or bus. How popular is Bhangarh Fort? People normally club together Sariska Tiger Reserve and Attraction while planning their visit to Bhangarh Fort. It was good. Better visit in winters/monsoon. Not as spooky as i imagined it to be but it was good anyway. Off my checklist finally! The fort has good points to click pics amongst the ruins. If you love or take interest in history or some supernatural powers (ghosts) , then you should visit this Fort. Visit to this Fort can also be a fun if visited with friends. Actually the current building is ruins of the bhangarh village, but still have some interesting parts in it to have a look. Make sure to visit this Fort in daytime, because entry is restricted after sunset by government. Also check the weather conditions before visiting the fort, as temperature here rise very much during summers. Great place to hangout with friends and family. If you feel like visiting the places, famous for ghost stories ... Bhangarh is First choice... one more plus point to be there is, it’s very near to Delhi. It can be a great fort to visit in one day from Delhi. It's a ruins of an old fort. If you are into history and love horror/ghost stories then this is the place for you. The view from the top of the fort (or whatever remains of it) is breathtaking. You can sea the distinct sedimentary layers of the fold mountain infront of it. There is lot of beautiful art work lying in the rubble of the buildings, if you roam around and look for it you'll find it. Good place for photography. It's a nice place to hangout with a group of people. I've gone here 4 times and haven't experienced any sort of incidents. The stories are just made up. Went here around 4-5 AM and didn't get any Kind of negative vibes. The place is beautiful with lovely sights though.